It's probably been a while since you've been to camp – or to a reasonable facsimile. So, we expect questions... and this FAQs page is where you'll find the answers. 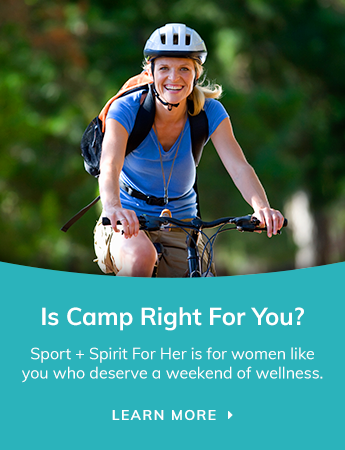 As potential participants submit questions to the Sport + Spirit team, we'll post them here, along with the answers. CAN'T FIND THE INFO YOU WANT? PLEASE ASK US! What are the size and amenities of the cabins? OK, let’s be clear. You will not be staying at a fancy resort property with plush “heavenly” beds. It’s summer camp, pick a single bunk and settle in! We have large cabins with rooms within (accommodating 2-4 ppl in each room) and cabins that accommodate 8-12 ppl). Cabins all have basic bunk beds (top and bottom frames) in them with glass windows/curtains and doors. There is also some open shelving for storage (most store bags beside bunks). Are there bathroom facilities in the cabins? Well, not 'in'... but close! Large restrooms with flush toilets, hot and cold running water and showers are located adjacent to all cabins. What bedding do I need to bring with me? Room service is not an option at camp. If you want 500 thread sheets to sleep in, you’ll need to bring your own! Feel free to bring as many pillows as you want to fluff up your bed. See packing list in our Getting Ready for Camp package. You will need to bring a single fitted sheet, sleeping bag or blanket, and pillow. Heck ya! Have you seen what happens when a bunch of women get together and have a fun-filled weekend? Our fully equipped Health Centre with a Registered Nurse on-site will make certain that participants receive immediate care for all their medical needs. Pertinent medical equipment is also readily available on camp including defibrillators, epi-pens and first aid kits. Is there cell phone service at camp? There is, but let's remember why you are coming to camp in the first place, to get away from it all! We are encouraging participants to keep their phones at bay and only use them sporatically. Although we would love for you to share all the fun experiences and pictures on social media, remember to enjoy the experiences, not just document them. Don’t pack the case of bottled water! Save room in the car for other beverages. You don’t need it. The water from the tap is just fine. The water for the entire camp is filtered from a deep well through a commercial UV water system and is very safe to drink. Water testing is done daily to monitor chlorine levels and ensure the water’s safety at all times. In the event of a power outage, the facility has a generator backup for the main dining hall and kitchen facilities, as well as the treated water system and main camp office. The entire water system is inspected by the Ministry of Environment (MOE) under Regulation 170 of the Safe Drinking Water Act. We have two words for you. NO BUGS! For that fact alone, the weather in September is beautiful. However, there's always the possibility of it being a bit cooler, so come prepared with layers. Can we go swimming in the lake? Typically, yes! Although we can't predict anything, the lake water is usually still warm from the summer. Swimming is just not allowed at dark. So, remember to pack your bathing suit, because a little dip in the lake is good for the soul. What dietary considerations can you accommodate? Leave the cooking to us this weekend, so what ever you need; we’ll have it covered. We can accommodate special dietary options for: vegetarian, vegan, lactose intolerant, gluten-free, no pork/no red meat. Please indicate any special dietary restrictions you may have when you register.